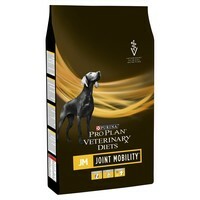 Pro Plan Veterinary Diets JM Joint Mobility Dry Dog Food is a complete veterinary diet to help promote healthy joints in dogs of all ages, including puppies. Specially formulated with increased levels of Omega-3 fatty acids (including EPA), to help support the natural anti-inflammatory processes in the joints, Purina JM has been shown to improve gait in dogs with decreased joint mobility, thus improving mobility and quality of life. Purina JM also contains natural sources of glucosamine and chondroitin; the building blocks of cartilage.